Political Polarization in Ukraine 2014: Opinion and Territorial Split Demonstrated with the Bounded Confidence XY Model, Parameterized by Twitter Data. Ukraine is currently a highly polarized country, which has been divided long before the turmoiling and belligerent political events in 2014. The outbreak of the civil unrest in Ukraine in 2014 was accompanied by an unprecedented increase of agitation and deepening of the opinion divide between the two political camps, and finally by regional separatism. Although a certain degree of opinion polarization is common for two-party political systems, where it is associated with muting the moderate voices and radicalizing the opinions, much less is known about the mechanisms of escalating polarization. 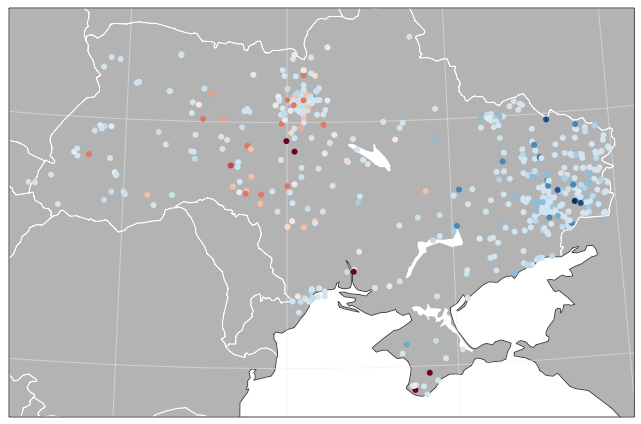 In our most recent work that will soon appear in Royal Society Open Science, we attempt to elucidate the driving forces behind opinion polarization and to identify the key parameters and signatures of its escalation, using Ukraine as a topical case study. We use Twitter data analysis to quantify the degree of involvement of Twitter users, the dynamics of opinion polarization and the level of emotional intensity, measuring how strong and fervent people feel about an issue. We feed the weekly Twitter data on emotional intensity into an extended Bounded Confidence XY Model, which represents interactive agents on a two-dimensional lattice and simulates the opinion distribution in real space. We demonstrate that the level of emotional intensity is a major driving force for polarization, and can lead to a spontaneous onset of collective behavior at certain levels of homophily and conformity. We find that the critical level of emotional intensity corresponds to polarization transition, marked by a sudden increase in the degree of involvement and in the opinion bimodality. The statistical mechanics of schooling fish captures their interactions. Collective animal motion emerges as a result of multiple interactions between the individuals. To better understand how these interactions and the resulting collective dynamics change with group size and age of individuals, we analyze the schooling properties of Pacific blue eye fish (Pseudomugil signifer) using a combination of traditional biological methods and approaches originating in statistical physics. We show that whilst repulsion forces have the same strength for different sized fish, attraction strength increases in larger fish, reflecting changes in fish movements at different developmental stages. 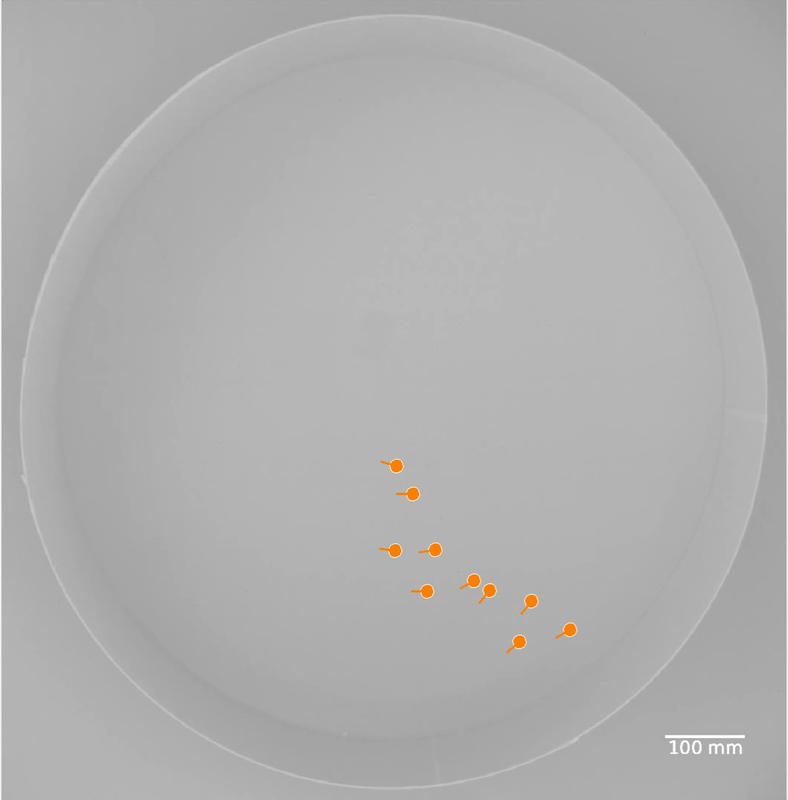 Our self-propelled particle model informed by experimental data successfully reproduces these behavioral differences. Read this paper: M. Romenskyy, J. E. Herbert-Read, A. J. W. Ward, and D. J. T. Sumpter. Body size affects the strength of social interactions and spatial organisation of a schooling fish (Pseudomugil signifer). Royal Society Open Science, 4:161056, 2017. The three-dimensional structure of fish schools under predatory attack. Schooling is often seen as one of the primary ways in which many fishes defend themselves from predators. The maneuvers performed by attacked prey can be complex and can involve extensive use of the three-dimensional space. In this project we quantify the spatiotemporal dynamics in fish schools in full three dimensions in the presence and absence of a predator. We discuss the role of predation in formation of several distinct collective states and in dynamic self-organisation in fish schools. A Turing test for collective motion. Animal collective motion is often studied through a combination of computational modelling and experiments. But is it really enough to compare the large-scale statistical properties of the model and experimental data to conclude that the proposed model adequately describes the observed phenomenon? In our work published in Biology Letters we addressed this question drawing inspiration from works of Alan Turing on artificial intelligence. We first built a self-propelled particle model informed by experimental data. 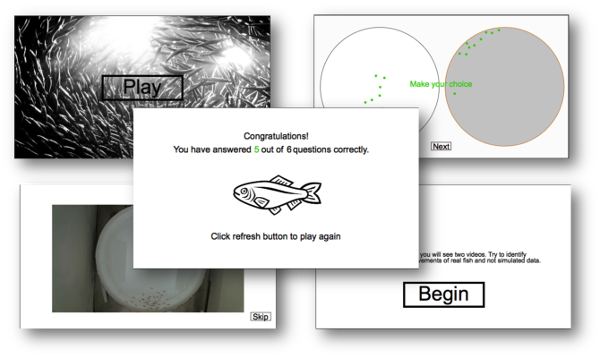 Then, we asked members of the public to complete an online test (a modified Turing test) in which they were asked to differentiate between the collective movements of real fish schools and those simulated by the model. Even though the statistical properties of the real data and the model were consistent with each other, the public could still tell the difference between the two. Our results highlight the importance of model cross-validation for achieving biologically realistic behaviour. On the other hand, these results demonstrate that we can use 'citizen science' to improve model fitting not only in the field of collective behaviour, but also across a broader range of systems and scales. Hysteretic dynamics of active particles in a periodic orienting field. Active motion of living organisms and artificial self-propelling particles has been an area of intense research at the interface of biology, chemistry and physics. 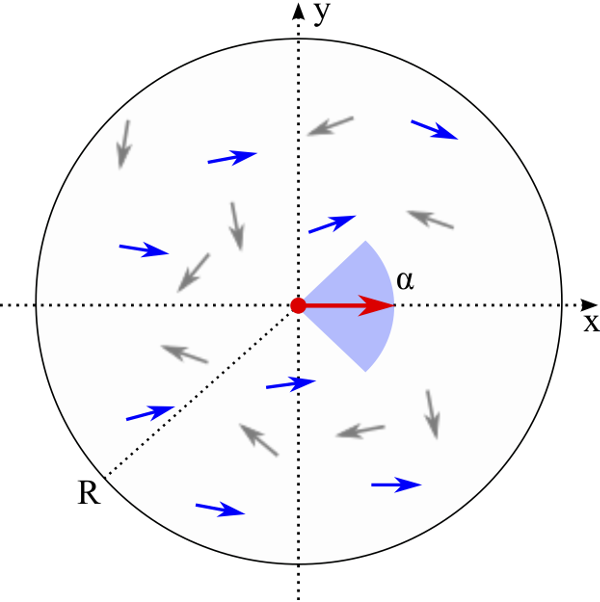 One of the observations that boosted the development of theory of collective motion is that the active species may behave much like magnetic spins: they achieve coherent motion by aligning their direction to the nearest neighbours. It remained unknown, however, whether a swarm can be also controlled by external field in a way similar to permanent magnets (such as compass needle). In our paper published in the Journal of the Royal Society Interface we studied the dynamics of active swarms in alternating fields. We measured hysteresis of the velocity of an active swarm in computer simulations and experiments on unicellular algae Euglena gracilis. 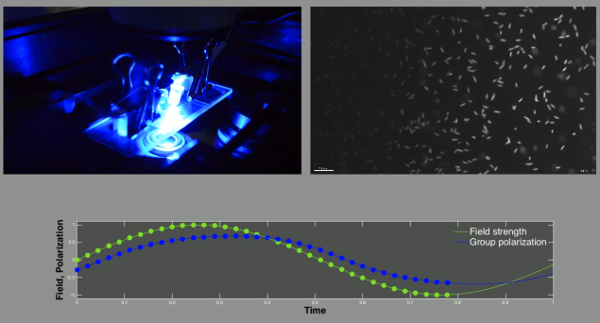 The phototactic Euglena cells were driven by variable illumination and tracked using microscopy. We found not only a full analogy of the observed active motion to magnetic hysteresis but also managed to quantify the controllability of the swarm and identify the signatures of collective behavior of the active agents. In particular, the collective response was only possible when the field was varying slowly and the active species had enough time to align their motion. The group’s motion was then more persistent than that of an individual. By contrast, at high field frequencies, the active group fails to develop the alignment and tends to behave like a set of independent individuals even in the presence of interactions. The observed laws might describe a variety of dynamic phenomena from the motion of synthetic active particles to animal flocks and herds, human crowd or opinion dynamics and help to formulate the general laws of collective behaviour. Tricritical points in a Vicsek model of self-propelled particles with bounded confidence. Mechanisms of collective behavior in groups of animals represent one of the most intriguing problems at the interface of physics and biology. The level of consciousness of the individuals apparently plays minor role for the large scale dynamics as the same general principles that apply to groups of animals or cells seem to govern also human social phenomena, traffic, and decision making. In our paper published in Physical Review E we study possible scenarios of self-organized collective behavior in a Vicsek model with bounded confidence. In our model, the active agents ignore their neighbors whose orientations deviate more than a fixed restriction angle from their own. The restriction angle thus quantifies the open-mindedness of the individuals. Like the standard Vicsek model, our model shows a transition into globally aligned state at low noise. We demonstrate in the limit of small restriction angles the critical noise amplitude decreases with that angle according to a power law with exponent 3/2. For small system sizes the kind of the phase transition to aligned state changes from continuous to discontinuous at a tricritical point. Moreover, at very small interaction angles the polar ordered state becomes unstable with respect to the apolar state. The dynamic steady states predicted in our model can be interpreted in terms of opinion dynamics: the globally aligned phase can be associated with consensus, while the nonpolar aligned phase with opinion polarization. 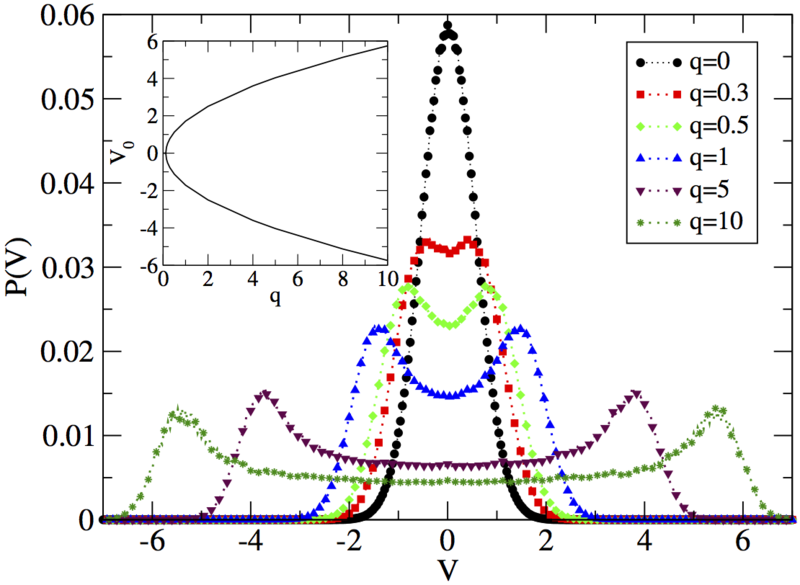 Collective dynamics in systems of active Brownian particles with dissipative interactions. Active matter forms a separate class of biological and physical systems that are essentially out of equilibrium. Such systems are extremely complex as they are composed of large numbers of active agents, each of which gains kinetic energy from the environment. In this work published in Physical Review E we study systems of Active Brownian Particles, where the individual agents in addition to "consuming" energy from the environment are subjected to pairwise interparticle forces introduced through Dissipative Particle Dynamics-like approach. We show that despite the alignment mechanism and the character of individual motion in our model differ from those in the well-studied Vicsek model (the main work-horse of the field of collective behaviour), it demonstrates identical statistical properties and phase behavior. 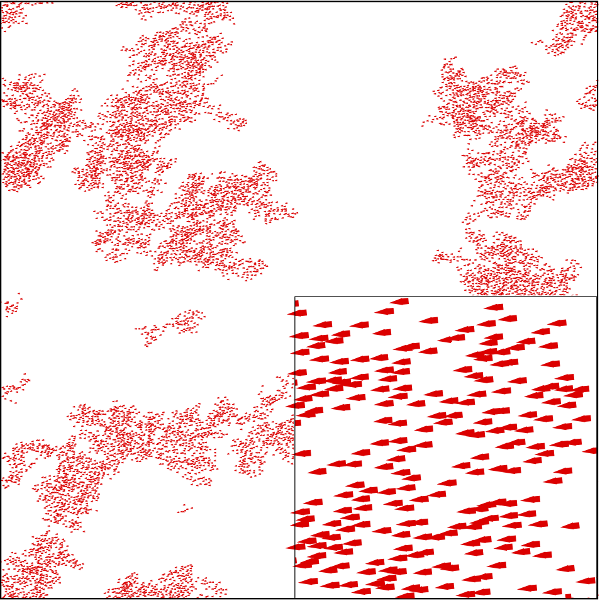 Statistical properties of swarms of self-propelled particles with repulsions across the order-disorder transition. Swarming is the spontaneous organised motion of a large number of individuals. 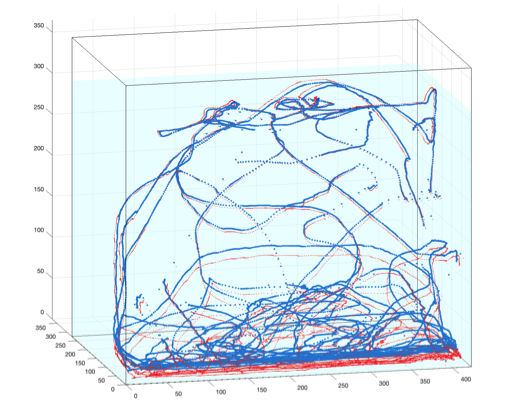 In this work published in European Physical Journal B we study dense systems composed of self-driven particles - autonomous agents that move at a constant speed and follow only two simple rules to update their direction of motion. The particles avoid collisions with their nearest neighbours and align with the neighbours located at slightly larger distances. We show that in addition to the transition to an ordered state on increasing the particle density, there exists a transition into a disordered phase at the higher densities, which can be attributed to the destructive action of collision avoidance. These findings shed some light on the physical mechanisms of the destruction of orientational order in overcrowded systems.